So amongst the many roadblocks, one suggestion was to use whole wheat pastry flour. For starters, that stuff comes in measly 5lb bags (or smaller!) and they are not very cost effective for a simple pizza crust. Instead, I save that flour for something more special…like brownies. So here I am with a 10lb bag of whole wheat flour and no way to use it for pizza crust. Upon further sleuthing I found a couple constructive ideas but I discovered that wheat gluten (yep the same stuff they use for seitan!) can be thrown into the wheat flour to make the dough more pliable and thus, resulting in a pizza crust that doesn’t give you the sensation of eating glass…So in my mission to spare anyone the grief that I went through to get to this point. I am providing you the VERY first recipe in this blog. I’ll admit, this is not New York pizza by a long shot and could use a but of tweaking, but for a pizza crust that would make Rip Esselstyn proud, this will definitely do the trick. I also provided poorly done photos that I took with my iPhone 4, just so everyone gets an idea of the step by step process. So without any further delay…. Dough so awesome that even my toes wanted to share the photo op! Once the dough has risen, you will want to stretch/roll/press (whatever suits your fancy!) the dough into a standard size pizza pan (not the jumbo one!). Let the dough rest in the pan for 10 minutes. This will allow the dough to rise slightly again which is what we are looking for. From there, you want to add your sauce, toppings, and any herbs you might want to use. I used low sodium crushed tomatoes as my sauce and topped with peppers, onions, artichoke hearts, and pitted kalamata olives. As far as herbs go, I used dried basil, oregano, garlic powder, red pepper flake, and freshly ground pepper and I baked the pizza at 425°F for roughly 15 minutes (check the crust every 5 minutes or so to prevent the potential of burning!). So there you have it…my first official recipe. I never thought it would be something as simple as pizza crust but this was a desperate time and I figured that there were others who were in the same rut. I would love to get feedback on this recipe along with any modifications you made because this recipe probably could use a few in order to turn it into perfection. I’m definitely open to suggestions and a great place to start is putting in the “Comments” section below…. 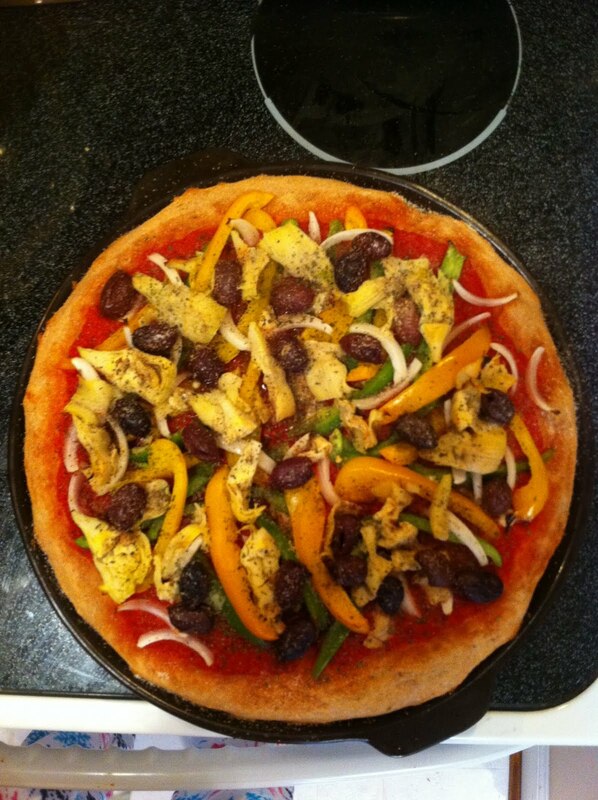 This entry was posted in Uncategorized and tagged dough, Engine 2, pizza, recipe, wheat by Robin. Bookmark the permalink. Try looking in The Thrive Diet by Brendan Brazier. There are some really funky and cool crusts in there using beans etc. Time consuming but very delicious. I’m making this dough for the first time tonight! Thank you for posting this! I was wondering the same thing, “Where’s the dough?” I tried several of the health food stores around here and can’t find one that looks “plant strong.” Have you ever tried to make a bunch of this dough at once and freeze if for future use?? I’m a big fan of being able to pull stuff out of the freezer! 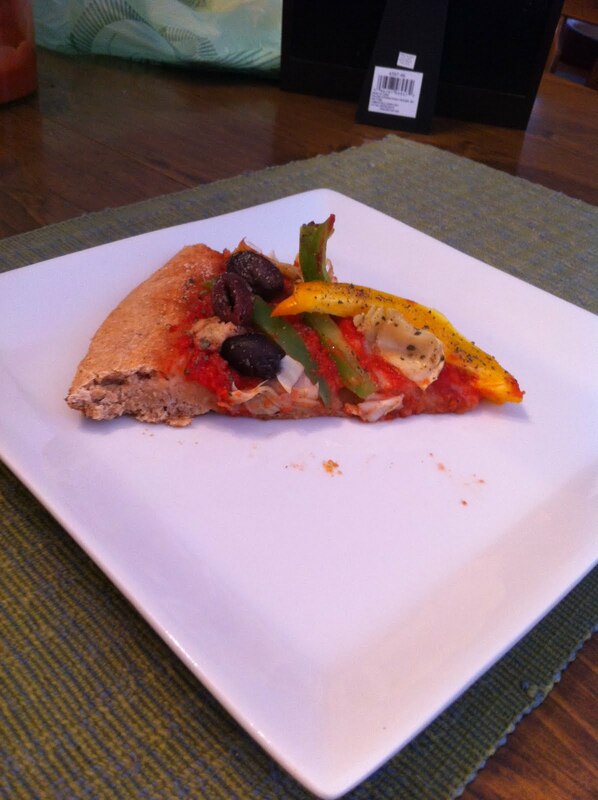 I just tried a store bought cornmeal crust (Vicolo)… but it had oil in it.I piled it with water sauteed veggies. It tasted really good but was really thick and had about 250 calories a serving for the crust and I wanted to eat way too much. I am trying to find a good recipe that is Engine 2 friendly too and thinner. I am thinking maybe trying to change your recipe up a little with the addition of cornmeal. Anybody try anything like that?? I have had similar frustrations. In the end, I have just gone to using whole wheat pita or naan bread and adding my sauce and toppings on top and broiling them. I’ve also started to become a huge fan of mexican pizzas using whole wheat tortillas and refried beans (fat free) as my ‘sauce’ and then adding a few veggies, some lettuce, soy sour cream and salsa. Did you bake the crust first without the sauce ? What temp? How long? My dough always comes out super wet, but once I add LOTS more flour, bake the crust 10 min., add the sauce/toppings and bake 15 more minutes, it’s good. Once it was AMAZING, but I’ve never had the same results twice. My usual recipe for baking a pizza (which is the same I did for this recipe) was that I did add the sauce without prebaking the crust and I baked it at 450F for roughly 10-15 minutes, checking often to make sure it doesn’t get too brown. Going to try this very soon! Will let you know how it turns out! I am trying it right now- seems a bit wet so I added some spelt flour for variety and also to dry it up a bit. Seems okay…hopefully I didn't mess this up! The final result was VERY good! Thanks! Tried your receipe and turned out great. However, I used organic unbleached white flour, which I know is not really recommended. I topped pizza with broccoli, onions, spinach, olives, fresh oregano and basil and topped with cashew cheese (which includes nutritional yeast). Really good! I am making it again right now…two of them. Thanks again! I tried your whole wheat dough recipe tonight, and it was fabulous! We makes pizzas in a wood-fired oven. My husband is very much a foodie, yet allows me to subject him to my nutritional whims (E2 vegan right now!). 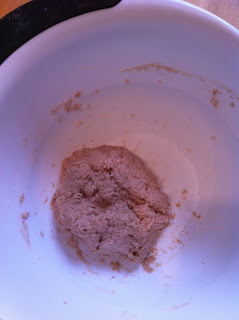 I did find that I needed to add additional flour as the dough was wet, but this isn't really an different than all the times I've made my usual dough recipe. Each batch is always a bit different, perhaps based upon the ambient humidity. Thanks so much for your efforts in creating this recipe and sharing with us! Thanks…I'm about to start the Engine 2 diet and I was thinking the exact same thing….Where's the dough? Thanks so much! Have just finished reading E2, and am working on changing our eating habits. And, yes, I was definitely in the same boat. Since I cannot even FIND these "approved" brands in the store, I figured I'd be cheating with my standard pizza crust. Now we don't have to! It looks wonderful! I found a whole wheat pizza crust recipe on Happyherbivore.com when I decided to try making my own crust. I think I'll try yours next! We just tried this and it's very good. No cooking time or temp given in the recipe, though, so we just guessed. This recipe was the result of a lot of tinkering around so I am not surprised that your dough came off as a bit wet…It's definitely a fairly forgiving recipe and once I have it mastered 100% I will definitely post it on this site! I am really glad it worked out for you! LOL! I found your site as I was googling “plant strong pizza dough,” as I couldn’t find a recipe in either of Rip’s books. Thanks for sharing! I’m looking forward to browsing through your blog. Thanks for the recipe! I’ve been searching online for the past few hours for a recipe that I would attempt. Yours is the winner! 😀 And for a thin cracker crust pizza, I plan to just use Ezekiel sprouted grain tortillas for a crust. Easier than making a cracker crust. Can’t wait to try your recipe! Thank you! I am a huge make at home pizza fan. 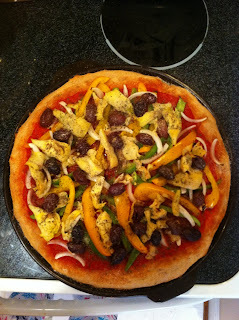 I had a great pizza dough recipe that contained oil and searched for one without….yours was the one I chose. I did change it up a bit, as I only have whole wheat pastry flour in my house and did not know of wheat gluten or have any, so I omitted. 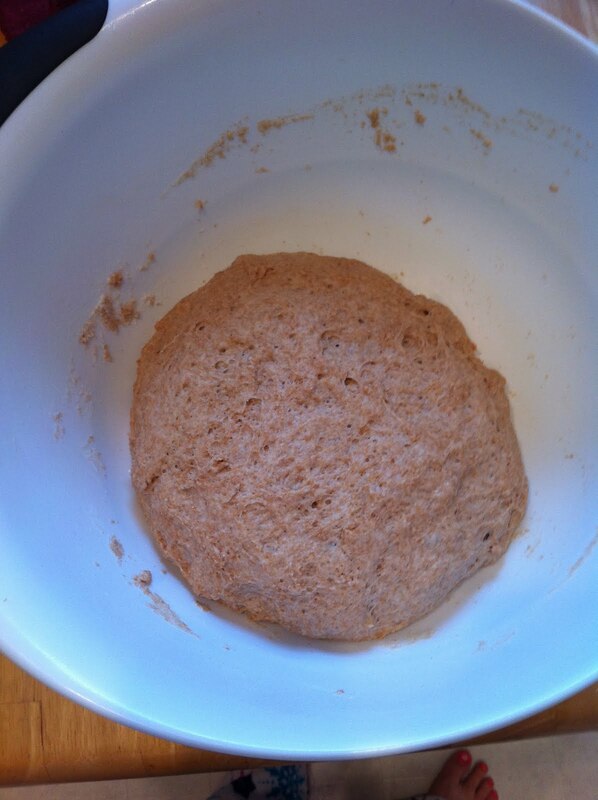 It did take a lot more flour then called for (probably because of my changes), which made it fill my large pizza pan. It was perfect! My pizza craving has been filled! I’ve made your pizza dough many times and it comes out great! It’s very delicious. Thank you! Any chance you have Engine2 approved whole wheat bread recipes that you could share? This may be coming a bit late, but when it comes to 100% whole wheat (or white) crusts, my favorites are those that involve a smaller amount of yeast and longer proofing time (perhaps overnight in the fridge). These are usually fairly wet doughs as well. I use Prairie Gold white whole wheat flour for everything which can easily found in measly 5 lb bags or in larger quantities from Amazon, Azure Standard, etc. As a Connecticut born and raised girl, my favorite pizza places don’t usually use much if any oil in the dough anyway, so that hasn’t been an issue for me. But I agree, the whole wheat can be a challenge. The longer fermentation usually brings out the flavor of the wheat: less cardboard, more flavor! P.S. The ingredients in a good recipe will be only flour, yeast, water, and salt, along with the long proof time. No sugar or added gluten or anything. I thought you had to use a small amount of sugar to proof the yeast? Have you tried this without the added wheat gluten? Seems like it would not be pizza-stretchy. I guess that’s the downside to using just whole wheat. If you use praire gold whole wheat white flour it should work very well. It is whole wheat but just a lot finer and lighter. I used it for a pizza crust (actually flatbread, haha, but turned out perfect as pizza crust) recipe. Use same amounts of flours. Hope it works out for you and enjoy. Praire Gold flour is found at Walmart but any Whole Wheat White flour works fine. His second cookbook has a polenta crust. It’s not crispy but it’s tasty! The book is entitled Plant-Strong.